I didn't know If I should put this in the build thread or with the campers. Being its going to be pulling a camper i put it here. This is an 03 Freightliner with 435 hp 60 series Detroit, 10 speed, 3:55 gears with full locker. 260 inch wheel base. A little longer than what I wanted but the hard work is all done. Everything on the rear end is new. From the locker to the bakes, brake cans, shocks, track bar the works. New drive line, carrier bearing U joints etc. I tried to nit pick it but I couldn't find anything wrong. 1.3 million on it. Never been overhauled but they pulled the pan and did the rods and mains. Everything around the engine is new or newer. Alternator and turbo are newer. Needs a right side windshield. That about the only thing I could find wrong. 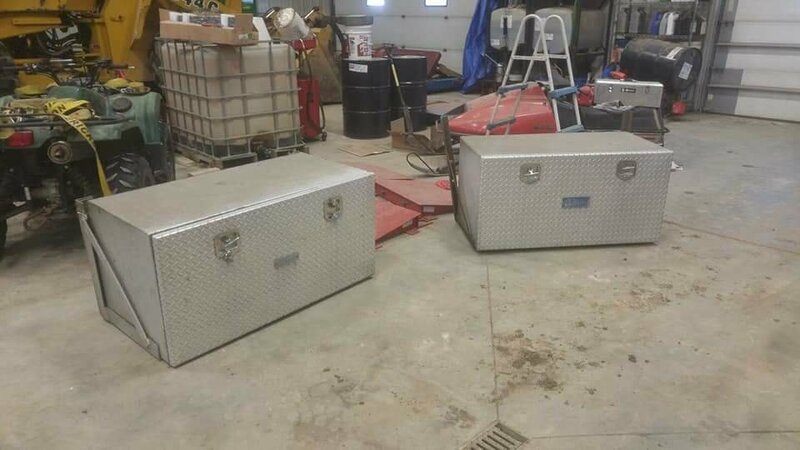 2 100 gallon fuel tanks. The former owner said he got 7 mpg with it pulling a semi trailer. I should get a little more than that. I should be able to go a 1000 miles easy with fuel to spare. First things first I have to get it registered as a Motor home. Ive talked to other guys in Nebraska. One guy had to go full out and put in fridge, microwave, sink and some other stuff before they would change the title. The other guy said he just went to the DMV and told them he needed the title changed. They did it no questions asked. I am going to try that approach. If I have to I'm just going to mount a pickup box camper on the back temporally to get past the plating. Once its plated its a done deal. As long as I never ever use it for commercial. It will be recreational use only or they can pull my plate. I have an 8 foot flat bed to install. Off of a Chevy dually pickup. That will come to just in front of the fenders. I think. Have more measuring to do. Right now everything is stuck in a snow bank. If its not in the snow its frozen to the ground. Right now I am in full debate with myself over what hitch to install. Its like a multiple choice quiz. A. B. or C. I know C is wrong and A and B are both right. But which one is MORE right. The trailer saver hitch rides on air. Low profile. Then we have the comfort ride. No air needed. It rides on these plastic cells. Tunable for any Weight Trailer up to 30K with Height Adjustments from 12" to 19"
They are very similar in price and weight rating. They both bolt flat so they are easy to install. I'm not crazy about the air ride because air bags eventually blow. But they have a goose neck ball adapter. Comfort does not have a ball adapter. How often am I going to pull the goose neck? I don't know. But I want the adapter. So before too long I'm just going to flip a coin and order a hitch. Some day I would like to move the rear end ahead and install a western hauler type bed to haul a jeep on. I have to raise my kids first and I have to pay for all this....Baby steps. Dang those are pricey. Why couldn't you use a conventional p/u hitch? Not trying to sound negative, just wondering if you plan on hauling 30k some day. I just want to see a snowy drift around a corner in this!! That back end looks so far out there! The bigger hitches bolt down flat and are lower profile. The medium size ones hook to rails. They are only a few hundred bucks cheaper. I dont know if I will ever tow 30,000 pounds but the guys I talked to have trailers that weigh around 20k. 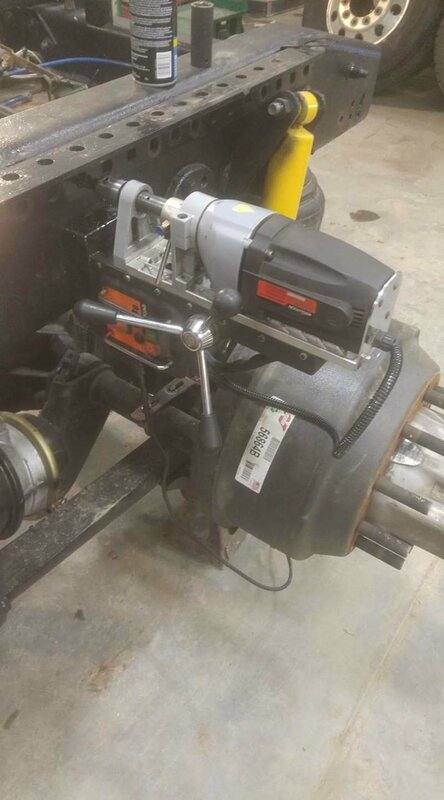 They said why max out the smaller hitch when you can get the bigger one and not worry about it. My philosophy is there is no overkill when towing. My camper only weighs 10,000 pounds. I want plenty of room to upgrade. I fully intended on putting a gooseneck hitch in and using the same B&W companion I use in my pickup. But. According to most of the people I talked to the suspension is so stiff on the trucks that it will tear the trailer up. Got everything dug out of the snow and in the shop. 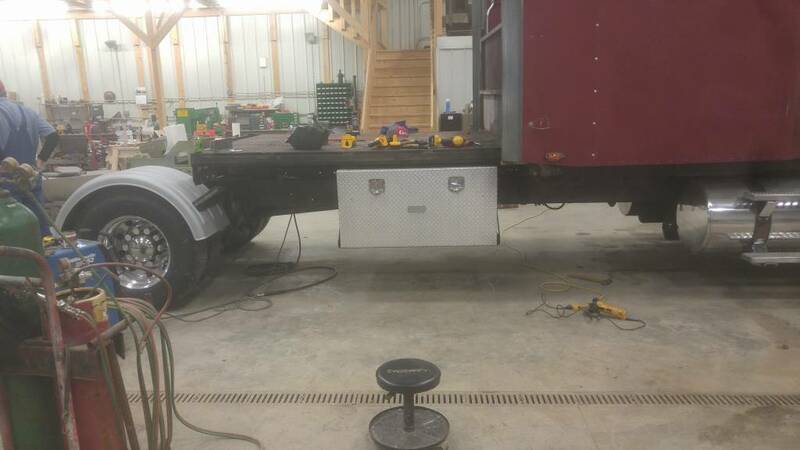 According to my mock up measurements the truck going to be 3 Inches too high. I have the camper where I want it going down the road. There is 9 inches from the frame to pinbox. Hitch is 12 inches tall. I think i can make it up by raising the pin box. I need to get the hitch installed before I have any real hard numbers. However I am banned from the shop until further notice because my son has the Flu. FJ, what size shop is that you have? 08 EX-Cab D-Max 4X4 45 gal. aux tank Pull-Right Super Glide 5th hitch, Prvt. Pilot ,NRA Life Member , Michigan CPL Holder , T-Bird II Experimental Aircraft Builder, Electrician Flint Truck Asm. Flipping the axles is another option. I have to do the bearings anyway so it wouldn't take much more to pull the axles. The John Deere dealer in town built their set up shop with a 24 ft ceiling per Deere specs. We followed their lead. For some reason I thought you were going to be building the camper on the back end of the tractor. I have no idea why. Bobby, that's what I thought as well. I think he tentatively planned on dropping a truck camper on it if necessary to get it titled as an RV guess that’s not in the plans any more. I didnt need to do that. I got titled as a motor home. I just have to put in a porta potty, fridge and microwave. Install a power inverter. Then I want to add a tv and dvd player. Seating with seatbelts in the sleeper for the kids will come also. 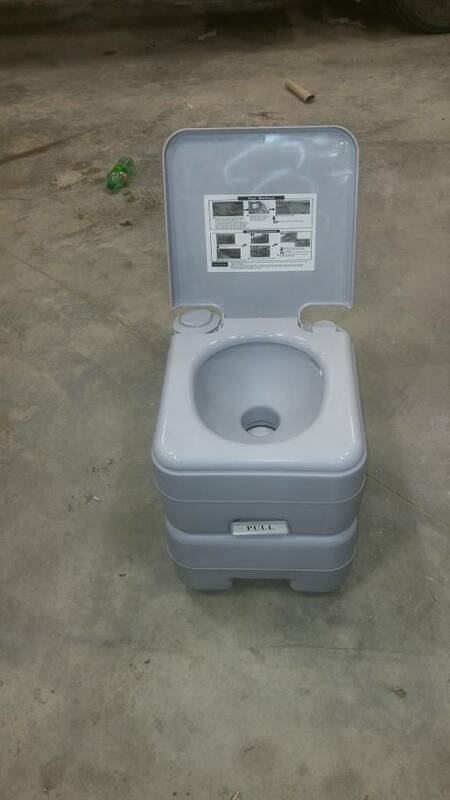 Got the hitch and porta potty ordered. Should be here end of the week. All kinds of stuff came in today. Got the 5th wheel, the 3/4 inch plate, my porta potty arrived and the Insurance man came over to check everything over. I opted for the comfort ride 245. 24,000 lbs capacity 5,000 lb pin weight. Way more than I need right now. I have room to upgrade. The angle irons with all the holes in them on the outside of the frame rails is what the commercial 5th wheel bolted to. I had to slide them back. Can use most of the factory bolt holes but will have to drill a few out. Then the plate is bolted to that you and the 5th wheel to the plate. 1/2 inch plate would have worked but the hitch manufacturer said it will bow with the big trailers so I went with 3/4. 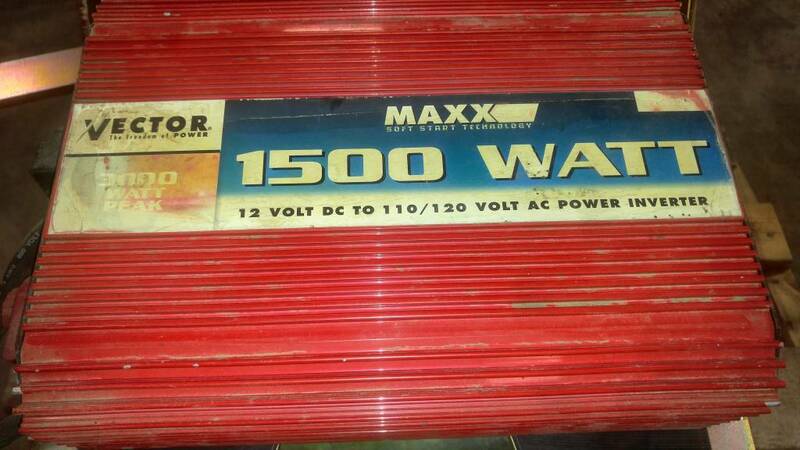 This 1500 watt inverter has just been sitting on the shelf for years. Before we got the service we use to keep it in the pickup to run electric tools. I would like a bigger one but this is big enough to run a fridge and small microwave. Do you or anybody else have any experience with the Harbor Freight inverters? I'm needing a new unit for my work truck to run an overhead AC unit and was wondering about quality. Now that's a sheet of steel! Woody, I put one in my fifth wheel and it still works if that means anything. Only used it a few times though. With that long WB you can have a nice carry area back there like for the quad in the other pic. With the long WB and the airbags you shouldn't tear up the trailer. Plus aren't diff grades of bags for a softer ride or air pressure? Air bags are all the same as far as I know. You can adjust the ride height somewhat. But it will always have the same air pressure for the load. Heaver load will be higher pressure so keep the ride height. The Hitch I bought has rubber cells in it to take the shock away. Ive never seen one in person and I never seen a video of how it works. I'm just going off others recommendations. Total leap of faith. I dont know anything about them. If I were going to run an A/C unit I would look into small generator maybe. Just so you don't kill your batteries. A/C unit would pull a lot of juice I think. JR generally the bigger diameter bag the softer they ride. Just don’t know if they make, or how hard it would be to fab, different bags and brackets. I have replaced many when I did that stuff. There are several diff types, some must ride better. Sure a regulator could lower pressure vs the adjuster that keeps the height. When I get the hitch on and hook up the trailer we will know better where I need to be. Got a little bit done in the past couple days. Mag drill is my new buddy. 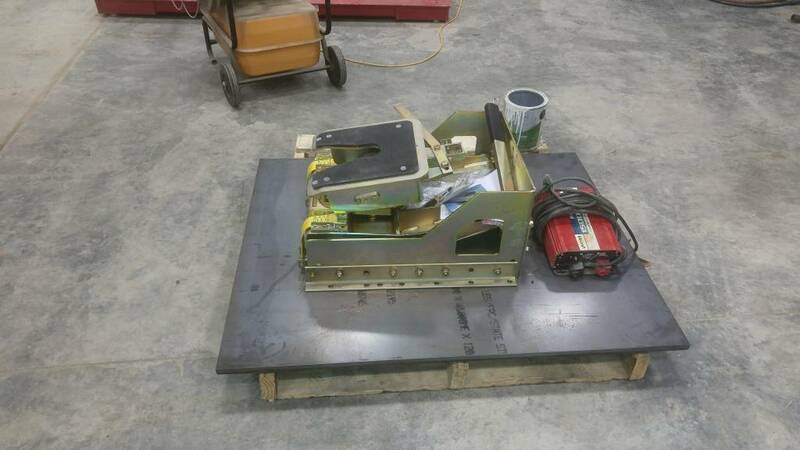 Mounting brackets in place and plate mocked up. Holes marked. Now i get to flip it over and start drilling. 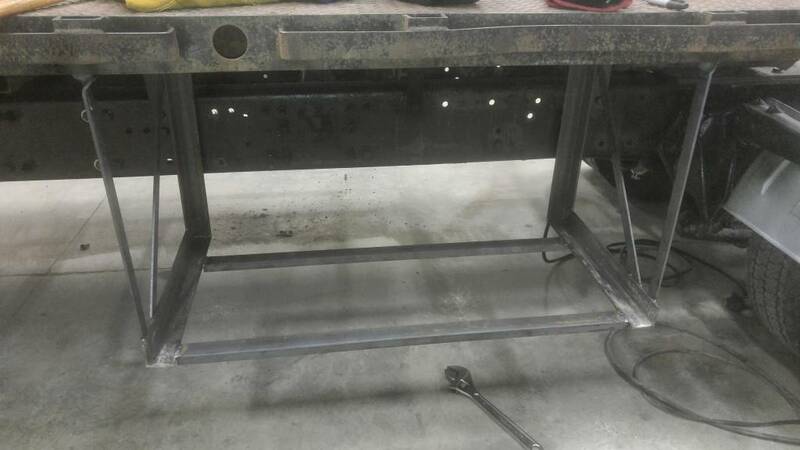 14 holes to mount the plate to the truck then 12 holes to mount the hitch to the plate. What brand is the drill? Always wanted one even at the shop we rented one a few times just never had enough jobs to substantiate the investment. Everytime I see one at an auction they go for new price too. It a Evolution. It a cheaper brand but works well. The shorter the extension cord the better. Use plenty of cutting fluid. The one I have is similar to this one in the link but the older model. Its been around here for 10 years I bet and probably only used it 5 times. But it has paid for its self. I thought they would cost more than that, we never used one but should have. A few of our gliders were alum framed so no good there anyway. There are a few brands that are over $1,000. This one works just fine. I suppose if you drilled a 100 holes a day you would want a better one. Got it all hooked up and she rides 3 inches high. The decision to flip the axles has been made. That will raise the camper up 3-4 inches. I got the fenders back on. 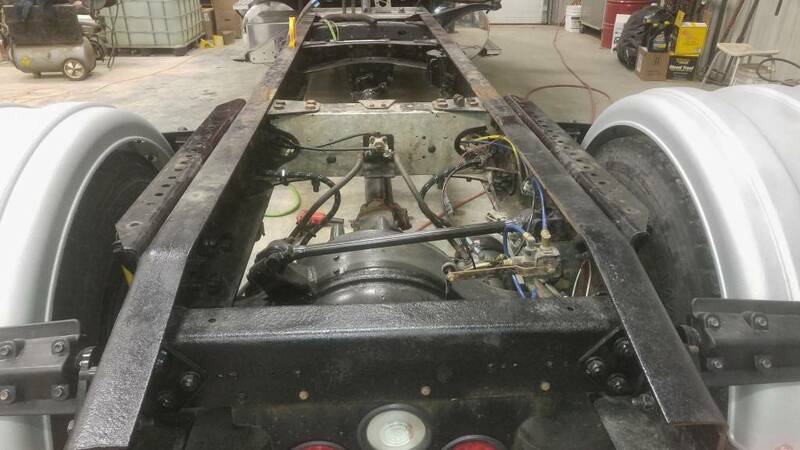 All that's left is wiring the lights and trailer plug. I do want to put some kind of receiver hitch on the back. I heard through the grape vine that a few trucks with motor home plates were getting tickets for having no rear bumper. Then I had a brain storm. 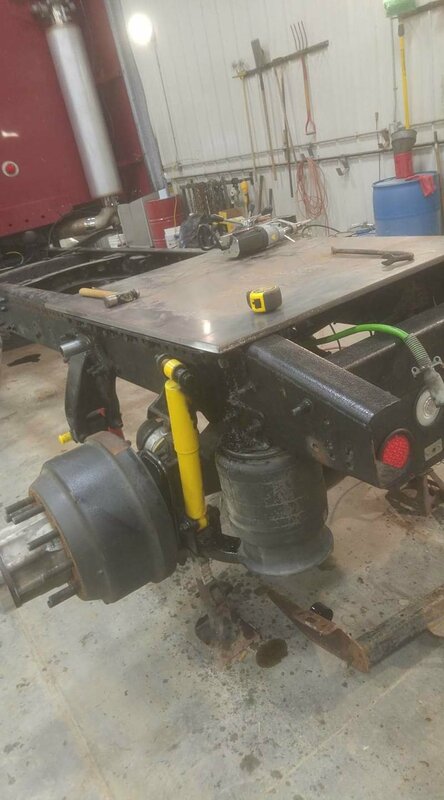 We took a bumper off one of our old straight trucks. It just has a hole for a drop pin. I do believe that will work. I don't know if its just me but I woke up this morning and had the gut feeling that some safety chains would not be a bad idea. From the 5th wheel to the plate. It is bolted down with 12 1/2 inch grade 8 bolts. I doubt its going anywhere. Nice job. 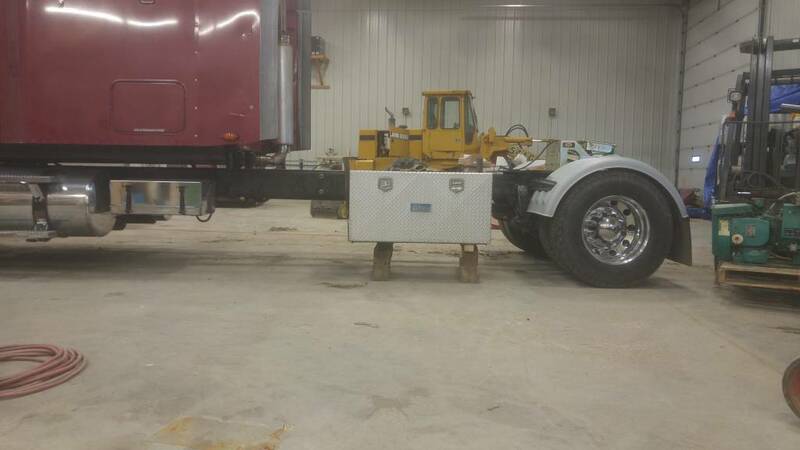 Looks like lots of room left for a side by side up front of the hitch!! Time for a bigger 5th. 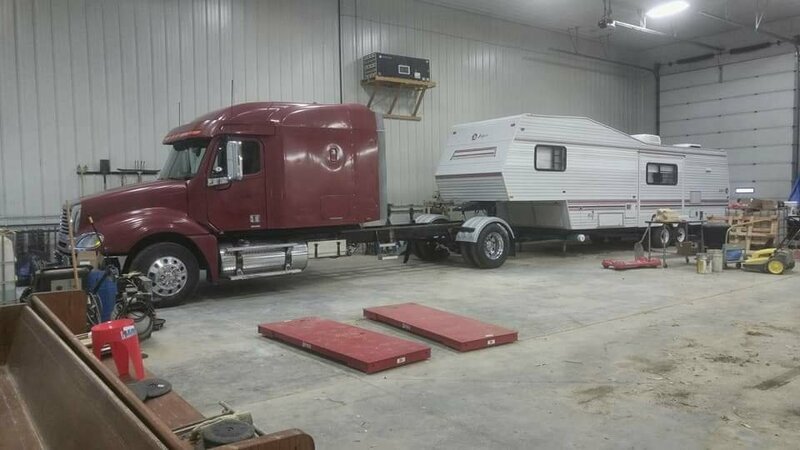 Yes indeed, brand new state of art 5th wheel with four slides and a new rig sitting on the flatbed behind the cab. You won't feel so bad when it is time to pay at the fuel stops. Nice to have all the room for fuel, right up to the time you have to pay for it. Nice set up as long as you have room to maneuver, doing a nice job setting it up. 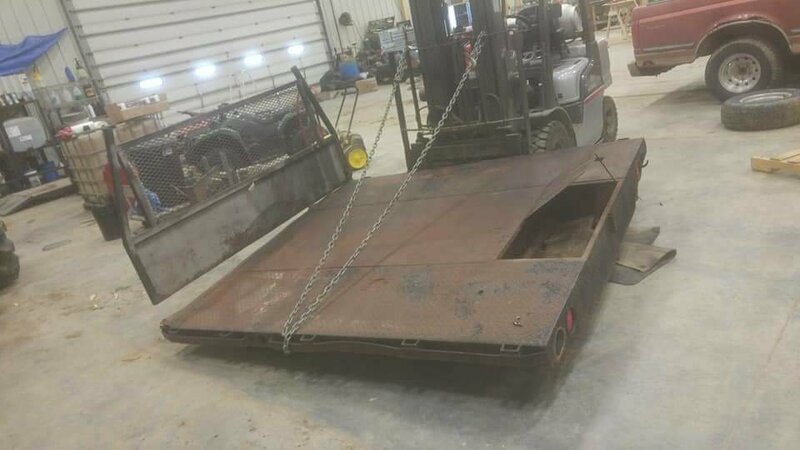 You should never have to worry about pin weight of a trailer either. Got the lights and everything wired and took it for a test ride today. Can't hardly tell it has a trailer at all. Don't back up too bad either. Now I have to finish the flat bed and interior. Nice job Jon!! that truck makes the trailer look like a play toy. Just a few inches shy of 60 ft.
That’s a good long load to pull into a Walmart p lot!! No doubt in my mind that truck won't even know the trailer is there. Good job. Looks like a winner. Ow to deck over the frame in front! Got my flat bed and took boxes. If they look like they all came out of a junk yard that's because they did. They look worse than they are. A little welding, polish and paint they will be real nice. One boxes will house a generator. 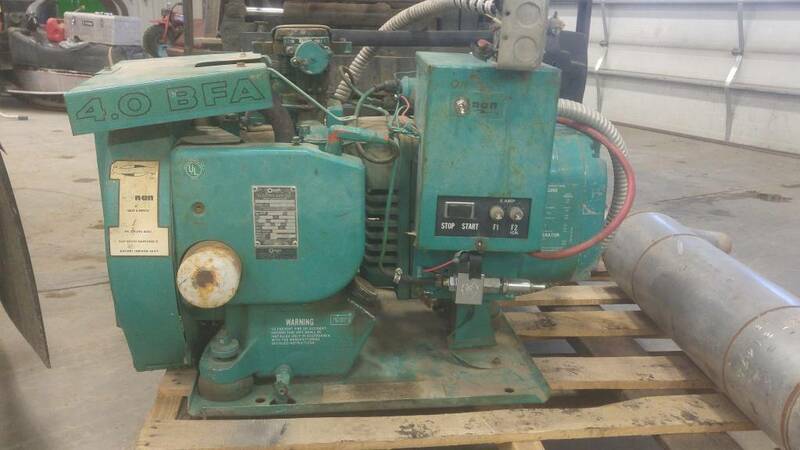 I bough ta a 4.0 bfa onan generator from the small engine guy in town. Came out of a bus. Nice finds. Hope they don't kill you prices like here in Ca. 300 apiece for the boxes. The flat bed is actually my dads but he did get it out of a junk yard. We have one of those deals where I can use it as long as I want but dont forget its his. I mocked up one of the boxes. This one is going to house the generator. Need to beef up the floor and cut appropriate holes for ventilation and the exhaust pipe. I am afraid its going rattle but should work out. We had some bad weather the past couple days so I got a lot done. With the help of my brother and our new hired man. Got the tool boxes and flatbed on. This one has extra bracing because that box is where the generator is going.